« Eat Local. Drink Local. Shop Local. This month, Beacon Hill Partners is excited to host an exciting forum on one of the highest growth tech sectors – mobile and app development. Across all digital platforms, the mobile-only user base is growing at 9x the growth rate of mixed mediums. 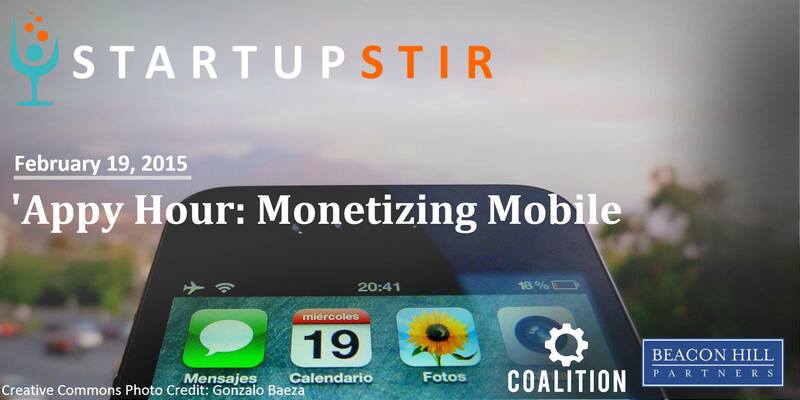 85% of developers and publishers monetize their apps. Let’s find out how these successful developers are making it happen! To get to the bottom of this, we’ve assembled an expert panel of app developers, big data app analysts, investors from the mobile space and more. Best of all, Startup Stir is an excellent networking event with complimentary craft cocktails sponsored by Deep Eddy Vodka and snacks by OTTO Pizzeria. This is an event you won’t want to miss!